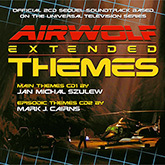 Airwolf Extended Themes is the sequel 2CD soundtrack album score to the earlier release from 1999 called 'AIRWOLF THEMES'. It was previewed with the earlier 2009 digital downloads-only release called 'AIRWOLF MAIN THEMES' EP and is a mix of 42 newly-recorded musical tracks based on the original three seasons for the high-flying, mid 1980s, American, action adventure, television series called 'Airwolf' (1984-1986), which starred Jan-Michael Vincent, Ernest Borgnine, Alex Cord, Jean Bruce Scott and Deborah Pratt. SPECIAL LIMITED EDITION SOUNDTRACK 2CD SET OF 2000 UNITS ONLY. Airwolf was a show that concerned an iconic, shark-like, supersonic, military helicopter, codenamed AIRWOLF (or known affectionately as 'The Lady' by the characters on the show ) and her crew as they undertook various missions, many involving espionage, with a Cold War theme. The series ran for 55 episodes on CBS in the United States in 1984 through 1986, and an additional 24 episodes (called 'AIRWOLF II' aka Season 4), created by a new Canadian cast and production company, aired on the USA Network in 1987, for a total of 79 episodes.